In one way or another, everything (fish, invertebrates, corals, seaweeds, bacteria) in the oceans and in marine aquariums react with oxygen. Most of the living beings of this planet require oxygen in order to metabolize nutrients, the principle byproduct of this reaction is carbon dioxide (CO2). Seaweeds (saltwater plants) ingest CO2 and expel O2 during the daylight hours, reversing the process at night, ingesting O2 and expelling CO2. Fish, invertebrates, corals, and bacteria ingest O2, expelling CO2 day and night. Your critters are not the only things that use oxygen in your tank. Organic materials (Dissolved Organic Compounds, all that stuff on that piece of uncured live rock, the uneaten food and fish detritus on the bottom of the tank) consume a lot of oxygen as they break down. There are some nitrifying bacteria additives which will multiply very rapidly, consuming a large portion of the available oxygen in the tank water. When using these additives, make sure that extra aeration is added to the tank. Saltwater has a limited capacity (saturation level) to hold O2. The amount of O2 that saltwater can contain is dependent on the temperature and salinity level of the water. As you can see in the chart below, the lower the temperature and salinity level, the more oxygen the water can hold. 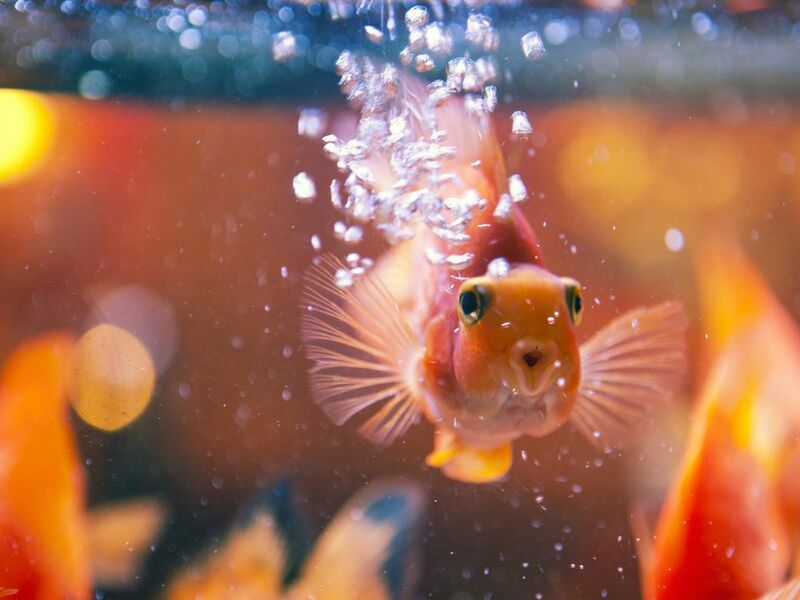 It is believed that a dissolved oxygen content of 5-7 ppm is sufficient for most aquarium occupants, while the first signs of stress will show if the content drops below 4 ppm and fatalities can be expected at 2 ppm. Dissolved Oxygen Test Kits (Compare Prices) is inexpensive and easy to use. Testing your tank water periodically is a good idea, particularly when the livestock load is increased, live rock is added or when the biological filter capacity has been increased or decreased. Overstocked aquarium (fish consume oxygen and produce waste, which consumes oxygen as it is broken down by bacteria. Filters and substrate clogged with fish waste and uneaten food. Poor gas exchange at the water's surface (that film of protein on the surface really slows gas exchange). A vast majority of gas exchange (O2 in, CO2 out) in an aquarium takes place at the water's surface. Vertical movement of water in the tank greatly increases gas exchange. This can be accomplished with powerheads, aiming for filter outlets, or installing airstones. While airstones are a great way to move water vertically in an aquarium, they are also the major cause of salt creep, which greatly adds to maintenance woes. Protein skimmers are also an excellent method for increasing the oxygen levels in marine aquarium water. Salinity is measured in ppt or Specific Gravity (SP) and the dissolved oxygen content in mg/l (ppm).